The dental office of Dr. Christopher T. Pawelek DDS is different from any other dental practice in the Cicero, NY area. We focus on making each and every part of your visit the most comfortable and relaxing it can be. As a gentle dentistry practice, we specialize in providing comprehensive, preventative, and restorative dentistry to adults and children. Our services utilize the latest technology with digital x-rays and intra-oral imaging. We feature advance cosmetic procedures including, Lumineers, all porcelain crowns, composite, (tooth-colored) restorations and teeth whitening. Advanced preventative services include ultrasonic cleanings, periodontal screening, and fluoride treatment for adults and children, and children's sealants. Our office places an emphasis on oral cancer screenings offering VizilitePlus for the early detection of oral cancer. Incorporating modern, innovative dentistry into a welcoming atmosphere allows our patients to feel completely at ease. Dr. Pawelek and his professional staff will provide you with the highest quality of care in the most courteous atmosphere to make sure your dental visits are a positive experience. Watch this video to see all that Dr. Christopher Pawelek, DDS can do. Dr. Pawelek believes in using the most gentle techniques, keeping the practice and dental office calm and serene. We use extra care so there is no reason for a patient to experience concern. Artistry meets science, as we create radiant smiles for people every day. Using only the most advanced technology, Dr. Pawelek can give you the breathtaking, head-turning smile you've always wanted. We have a beautiful office located just off Route 31 in Cicero. We have a wonderful staff who would love to get to know you better. Drop by and visit with us or call us at 315-699-2685. 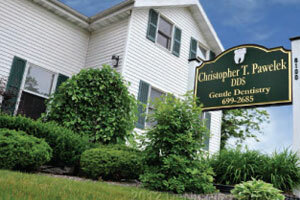 The dental office of Dr. Christopher T. Pawelek DDS is different from any other dental practice in the Cicero, NY area. We focus on making each and every part of your visit the most comfortable and relaxing it can be. As a gentle dentistry practice, we specialize in providing comprehensive, preventative, and restorative dentistry to adults and children.